WE ARE PROPERTY OWNERS! YAY! We closed on our lot Wednesday afternoon. The lot has felt like it has been “ours” for a long time, but now it’s official. Our blueprint meeting is tentatively scheduled for June 10th. I would like to break ground before July, but we’ll see how it goes. At the property closing meeting the accountant for the building company said she expected that we would be in by the end of the calendar year, which would make me very very happy. I’m sure it would also make Dave happy, given that he almost had an aneurysm when he saw the rent rates we will be paying after signing (another) short-term lease in August. I mentioned awhile back that I was considering a trip out to Buffalo, NY. The date isn’t 100% confirmed yet, but it looks like I’ll be making the trip in a couple of weeks. The good part is that my mom will probably come and keep me company, the bad news is that I’m going out there to get yet another consult on my back problems. It’s as good of a time as any to get another consult, because I’ve been in pretty bad constant pain since we returned from Las Vegas. My back gets angry when I walk a lot, and the LV strip and Fremont Street require some walking. I hate to limit myself or to miss out on anything because of my back, but I pay for it in pain later. It’s no secret that I loooooove Brian Williams. You know, the anchor of the NBC Nightly News. LOVE HIM. I love his sultry voice, but I also really like his reporting. So when I had the chance to watch a special with him interviewing Edward Snowden this week, I jumped on the opportunity to hear one more hour of his sultry voice. Ok, I’m not all that shallow. 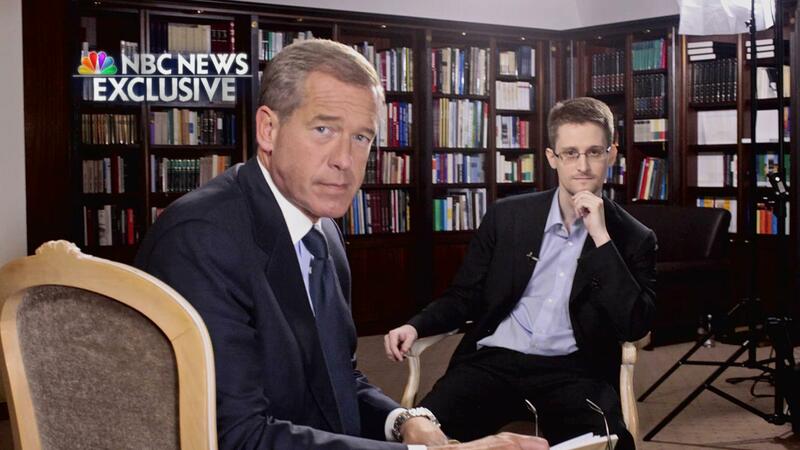 I was also intrigued that Snowden picked Williams to do his first American TV interview. If I was Snowden I would have made the same pick, but probably for different reasons. I would just want to meet Brian Williams and hear his sultry voice in person. Anyway…I digress. I didn’t follow the big Snowden story all that closely when it first broke. I’m not an American, I can’t vote, so I don’t really follow much political stuff. I was a little intrigued though….why would this guy who apparently had a somewhat normal life living in Hawaii throw it all away to go on the run from the American government? He poked a sleeping bear and made it very angry. Who does that!? Anyway, I won’t ruin the interview if you haven’t seen it, but if you haven’t seen it you should consider watching it here. Keeping on with my TV watching habits, I mentioned a few weeks ago that I was enjoying watching American Dream Builders on NBC. I said that I thought Lukas should win it all. Turns out Lukas won it all. That said….if the decision was only on the house they designed in the finale, I think Jay should have won. Because seriously Lukas….who paints a beach house black!?!? By far his worst decision of the competition. Happy anniversary to my parents, who are celebrating 33 years together!